Contemporary and eclectic, this capacious property includes a beachfront villa and seaview villa behind. Amenities satellite LCD TVs, DVD players, stereo, WiFi broadband internet, iPod docks, full air-con, 2 fully equipped kitchens, 2 kayaks, table-tennis, pool table, Nintendo Wii. InAsia is a contemporary designed villa located on the sunset-facing west coast of Koh Samui, overlooking the scenic Five Islands. With direct frontage onto a powder sand beach, this spacious home comprises 7 en-suite bedrooms, sleeping up to 14 adults and 2 children. The property is designed in two distinct and independent adjacent villas, which are directly on the beach, and immediately behind. 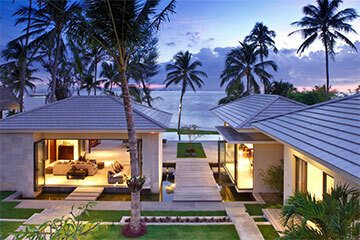 The beachfront villa is designed around the infinity-edge swimming pool, with a central open living area. A grass lawn separates the pool from the beach, which is accessed down a couple of steps. The swimming pool includes a shallow ledge for younger children, or lounging in the sun. The pool is flanked by a sandwash deck with loungers, and the main communal living areas, including a sunken sala pavilion with built in sofa-benches, a bar, the living room, al-fresco dining area, dining room, and kitchen. The living room features foldaway glass walls, and is furnished with ceiling fans, air-conditioning, sofas, coffee table, and a large LCD TV. The kitchen-dining room also opens up with foldaway glass walls, and includes a fully-equipped kitchen, together with an elegant dining setting for 8. In front of the kitchen, at the poolside and overlooking the beach, is a second al-fresco dining set. At the rear of the beachfront villa are 4 en-suite bedrooms. Two of the en-suite bathrooms are fitted with walk-in rain showers, while the master bedrooms feature both bath tubs and walk-in showers. There are 3 double bedrooms with King-size beds, and 1 twin bedroom. One of the master bedrooms is elevated on a mezzanine floor, with a private TV lounge below. Double wooden doors at the rear of the beachfront villa leads to the 3 storey sea-view villa directly behind. This 3 bedroom villa is set within a walled garden, with gated entrances to the front and rear. On the ground floor are 2 double en-suite bedrooms, with glass walls overlooking the verdant garden. The pool and living area are located on the first floor, with a large infinity pool overlooking the sea over the roofs of the beachfront villa. The pool is flanked by a deck, with a large sala pavilion at the far end, which is furnished with deep lounge sofas. To the rear of the deck, glass doors open on to the open-plan living area, which includes a TV lounge, dining set, and fitted kitchen. Upstairs on the top floor is the lavish master bedroom, which benefits from panoramic sea views, a large private balcony, and en-suite bathroom with tub and walk-in rain shower. InAsia is a capacious and private beachfront property, which is ideally suited to larger groups of families and friends. The beach is particularly attractive, and home to several neighbouring luxury villas that offer further accommodation for larger gatherings if required. Located on the West coast of Koh Samui, 10 minutes from the ferry port of Nathon and 35 kms from Samui’s international airport. Santiburi Championship golf course is 25 minutes drive away. 8 bedrooms, sleeping up to 16. 7 bedrooms, sleeping up to 14. 6 bedrooms, sleeping up to 12. -Extra bed charge is $50++ USD per person, except during Xmas/NY, when it is $100++ USD.